Lambdas are introduced to reduce the bulky code overhead of an anonymous class. In this article we will learn what anonymous class and lambda expressions are and what was the need of introducing lambda expressions in Java. An anonymous class is a local class without a name. The class gets declared and instantiated at the same time. Even for effortless operations, additional syntactical code is to be written each time with anonymous classes. So, the main concern with the anonymous class is its unclear, bulky code i.e., overhead. Lambda expressions eliminate the need of using an anonymous class. It is a functional interface with a single method only. These expressions also provide a powerful, functional programming capability to Java. In this example, we will see why lambdas were introduced. As we all have used the popular functional interface java.lang.Runnable, we know only a single method is declared in Runnable interface i.e., void run() . If you have worked on creating a thread before, you will know the start() function is required to initialize the running of a thread. The start() method then calls for the run() method. The example below is shown using lambda expressions: () -> System.out.println("Thread running ") is our lambda expression. Below is an anonymous class, bulky and unclear code in comparison with the above code. The overhead is less while using lambda expressions. That is why the introduction of lambda expressions is considered one of the prime features of Java 8. Now, let us focus on what a functional interface is and how it is related to lambda expressions. In this section we will discuss what functional interfaces are, the role of @FunctionalInterface annotation, java.util.function package for Java 8, and how a functional interface is related to lambda expressions. Let’s start with functional interfaces. An interface is similar to a class in Java and a reference type. All of the methods in an interface are abstract, so a collection of abstract methods is also called an interface. A functional interface is an interface with only one abstract method declared. Below is a simple code snippet. Department is our interface and DeptInfo is the single abstract method. o The role of a new annotation is definitely a topic to discuss. One may ask, what was the need of introducing a new annotation? Verifying the functional interface isn’t necessary, because a compiler will do it on its own. But, still it is suggested to specify @FunctionalInterface annotation to reduce the workload, just like the @Override annotation in earlier versions of Java. If you already know that you’re going to use lambda expressions, annotate the interface with @FunctionalInterface. Department is our interface and DeptInfo is the single abstract method, but we have also used the annotation @FunctionalInterface . Java 8 has defined a lot of functional interfaces to be used comprehensively in lambda expressions. Functional interfaces are defined in java.util.Function package discussed below. With the introduction of Java 8, a new package was added containing functional interfaces commonly used for lambda expression and method reference. The newly introduced package is java.util.function. Two of the interfaces are explained below. Because it is a functional interface, BiConsumer can be used as a target type for a lambda expression or a method reference. It represents an operation that accepts two input arguments and returns no result. T - the type of the first argument to the operation. U - the type of the second argument to the operation. Function , also a functional interface, can be used as a target type for a lambda expression, or a method reference. It represents a function that accepts one argument and produces a result. T - the type of the input to the function. R - the type of the result of the function. For the complete list, refer to the officialOracle Java Docs. The syntax of lambda expressions is different from what we have generally followed in Java. The general way is given below. A lambda expression can contain zero or more arguments. More than one argument is separated by a comma (,) operator. Note: The argument type (data type) can be eliminated while passing it to lambda expressions. That means (int x) and (x) are same i.e., it is optional to mention data type. For example, both of them will work correctly. Note: You can eliminate the () in the case of a single argument, if its type is inferred. The body of the lambda expressions can contain zero, one or more statements. Therefore, we can conclude that, the following are optional in lambda expressions structure: curly braces, return statement, type declaration, and parentheses around a single argument. Let’s move further using a working example to understand how different forms of lambda expressions can be used in a Java program. Below, I have created a class and in which I am performing an addition and multiplication operation. We have used the rules for creating lambda expressions, which includes type int declaration and type int declaration with a return statement. It also shows how we can eliminate the () in the case of a single argument, if its type is inferred. In the following image you can see the output for class LambdaExp, I have run it on Java 8 Online compiler. 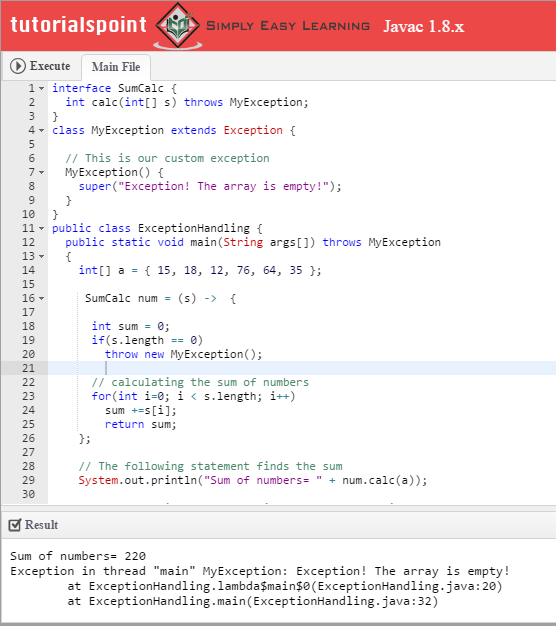 Observe that the class LambdaExp has two interfaces: Calculate and Display . Both of the interfaces have a single method in them: operation() and DisplayMessage() . The operation() method performs addition and multiplication, whereas the DisplayMessage() function prints the message to the console. 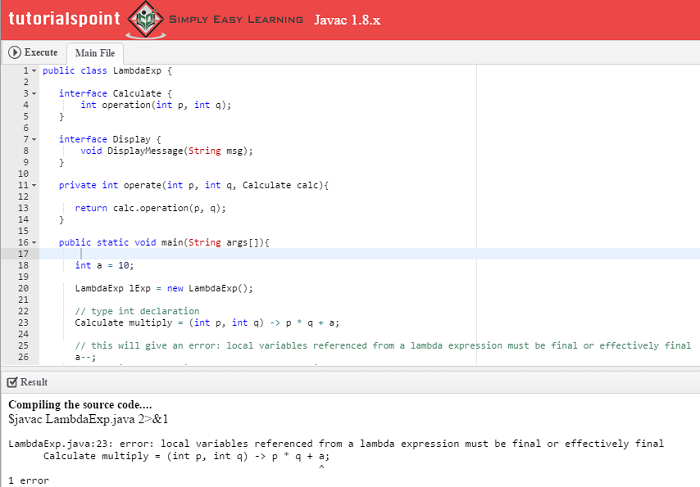 Various types of lambda expressions define the operation() method of Calculate interface. Then we have defined the implementation of DisplayMessage() method of interface Display. Variable capture occurs when a lambda expression try to use a local variable from its enclosing scope. However, this variable can only be used and should not be modified. Modifying it will cause an error since these variable are effectively final . The effectively final variable is a term which means that a variable whose value is never modified, once it is assigned initially. The concept of exception handling in any programming language is important and lambda expressions in Java also has a concept of handing exceptions. If checked exception is thrown, then the exception should be compatible with the exception listed. These excpetions are listed in the throws clause of the abstract method in the functional interface (shown in example below). Here's a code snippet in which we have created a custom exception, MyException . In the class, we are calculating the sum, but while passing a zero-length array, it throws an exception with the message, " Exception! The array is empty! ". The exception is listed under the throws clause of calc() function, which is declared inside the functional interface SumCalc . Lambda expressions were introduced in Java 8 to make it easier for developers to write clean and clear code. Anonymous class implementation is easy, but the syntax may seem bulky. Lambda utilizes a light-weight mechanism reducing overhead and eliminating the need of using anonymous classes.